Computers are meant for doing almost all kind of activities. But well, smartphones nowadays are no less than that. But I know, how it feels, when you are immersed in your work, as and you get a message from your girlfriend, asking you for a date. Well, giving the reply to the message is important, as work life without personal life is no fun. But to give a reply to the contestation, you need to get hands on the phone, unlock the screen, and it is only after that you can give a reply, and that too by typing on a small screen, which might lead to errors, if you are typing very fast. Eventually, after everything, there is every possibility, you will get distracted from your work, which is something you really do not want. 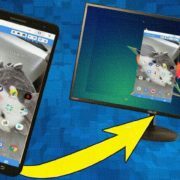 Thanks to the Android mirroring apps, which can directly send the notifications to your computer, which can be helpful for you to type messages, without the need of typing on the palm-sized keyboard on your phone. Pretty handy right! Due to the popularity of Android mirroring applications, you can find a number of them on the Google Play Store, but all of them do not work up to the mark. Let’s find out the best applications, which you can go for if you do not want to get stranded between your smartphone and the computer when you get notifications on your smartphone but have to complete your task within the deadline. A few of them are free, while others are paid, but all the mirroring applications provide some basic functionalities for free, which in most cases, can cater to your needs. Pushbullet is by far one of the best mirroring apps, which is not only available for Android but is also available for a number of other devices, which include Windows, iPhone, etc. With the help of Pushbullet, you can not only give a reply to your text messages, but it also supports a number of other cross-platform messaging applications, like WhatsApp, Telegram, and many more, which is another reason, Pushbullet is my favorite. As the name suggests, you can sync notes between your smartphone and computer, with the help of Pushbullet, which make the app very handy. You do not need to pay any money to the developers for getting the basic features. You can also get access to the remote files on your mobile, so that you do not need to search for your data cable, for transferring important files. If you go for the paid version, you can also get access to other notifications, for example, start playing YouTube videos on your computer, directly from the notifications of your smartphone, disconnect calls, from the computer, and many others. But if you are not a power user, who really need those features, the free version of PushBullet will surely serve your purposes, as you will hardly worth any kind of YouTube videos, while you are working at your office. Its app is available for Chrome, Android, iPhone, Firefox, Opera, and Windows. Easily send files between computers and your smartphone. Give the reply to various cross-platform messaging apps. Get the notifications of your smartphone directly to your computer. With the free version, you can only send files up to 25 MB, but you can transfer files up to a size of 1 GB, which is also pretty less, for the premium version. Most games and movies nowadays come with size more than 1 GB. With the free version, you can send up to a maximum of 100 messages per month, though you can send unlimited messages with the premium version. The user interface can be a little difficult for novice users, which could have been simpler, to suit the needs of all the users. 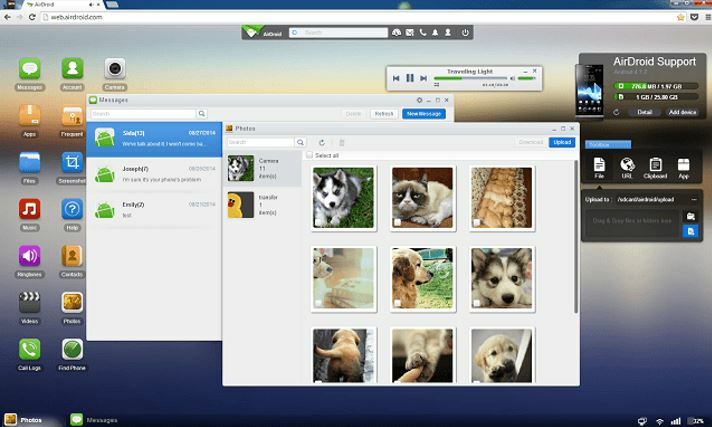 AirDroid is another one of the oldest mirroring apps, which is exclusively available for Android. It gives you a very clear interface, better than PushBullet, but you can find advertisements on both the app and the interface, the webpage, which you can find on your computer. With the app, you can send messages through a number of popular cross-platform messaging apps, apart from SMS. Just like the previous one, you can also send files, which is really great. Though there is an application for Windows, which can directly show you the contents from your smartphone, if you are running low on space come on your computer, you can directly use your browser, to see the contents. If you go for the premium version of AirdDroid, you can get access to the camera of your smartphone remotely, in order to capture photos and videos, remove the advertisements, and can find your phone, if you lose it, either within your home or somewhere else. But if you just need to type fast, while giving a reply to messages, you can always go for the free one, and if you want to get extra features, you are at liberty to purchase the paid version. Easily send unlimited messages through your cross-platform messaging applications, which is one of the biggest advantages. Very easy to use interface, and normal users can easily start using it, without an expert knowledge. No need to use any kind of application and everything can be handled directly from the web browser, to just by just entering the remote IP address. The premium version is pretty economical, compared to other Android mirroring applications, which belong to the same class. The data transfer between your computer and smartphone is limited only to 200 MB, which is though a limited in case of the premium version. But the individual file size still has restrictions, which is 30 MB for free users, and 1 GB for premium users. As the name suggests, it really gives you a number of options to customize the way you send text messages, but if you are more towards instant messaging or cross-platform messaging applications, MightyText is not for you. It is meant for those users, who is in a lot of messages, and want to see the photos and videos directly from the smartphone to the computer. The user experience of the app is not bad, but it could have been better if it included the option to send messages through other cross-platform messaging applications. You can also schedule messages, get a number of themes, which can be helpful for some but not all. I will consider this app to be a high priced one and is specially optimized for those who send a lot of messages. Though, with the free version, you will only have the option to send and receive SMS messages, and multimedia messages. 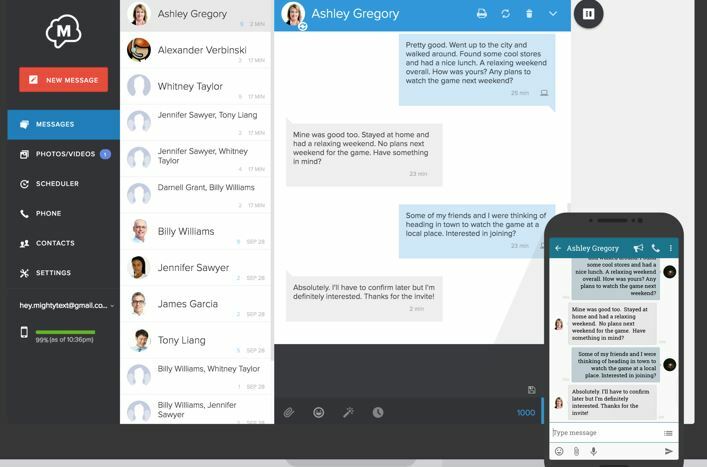 It is great for those, who want to get the best experience of texting, directly from their computers. See the photos and videos directly from your smartphone, and send them to multimedia messages, without any hassles. The setup of the app is very simple, and normal users can also use the app, and the web user interfaces without a lot of knowledge. The developers could have included a number of extra features, as it comes with the up high price tag. Other basic functionalities like email sync are only available with the premium version, which is quite disappointing for the free users out there. 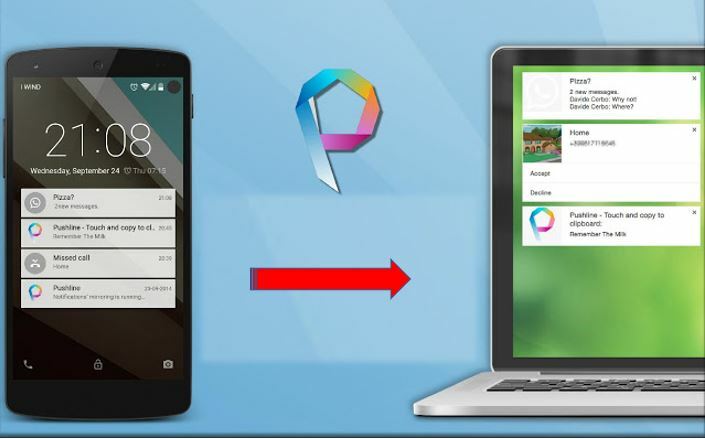 If you are not expecting a lot from your Android mirroring app, Pushline is something, which you can go for. Compared to the previous apps mentioned above, Pushline has nothing special. But, if you are looking for a lightweight mirroring application, Pushline is the best for you. The app can help you send SMS messages, import and export contacts, back up apps, accept and reject calls, etc. But, you cannot do any other activities, like giving a reply to WhatsApp messages or others, with this app. 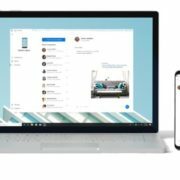 Pushline can also transfer notes and links between your smartphone and computer (PC/MAC), just like other mirroring apps. Thus, Pushline is great for basic functionalities, but not handling notifications from third-party apps. Great for those who want to get focused on their work, by avoiding unwanted notifications. Very lightweight, and is very easy to set up. Do not come with a number of options, compared to other apps of its class. You can also find a number of other mirroring apps, available for Android and other operating systems, but I am not mentioning the details of them, as they do not stand up to the mark and are not one-stop applications for mirroring. Most of the applications can do a single task, and thus cannot be considered as complete mirroring solutions for your smartphone. You can surely try out MySMS, Infinit, which claims to be Android mirroring applications, but I don’t think them to be so. They can be helpful in transferring files, but you cannot get the status of your smartphone, or use of various resources offered by your smartphone to those apps. Still, if you find any of the apps worth mentioning in the list, don’t hesitate to comment down below. If you are using a better mirroring app for your smartphone, also let us know about that, in the comment section down below.